When folks learn I'm a Franciscan -- specifically, a Secular Franciscan -- the inevitable question I get is, "So, what do you do?" The thing to understand is that we Franciscans aren't about doing. We're about being, and everything that we do flows from that being. 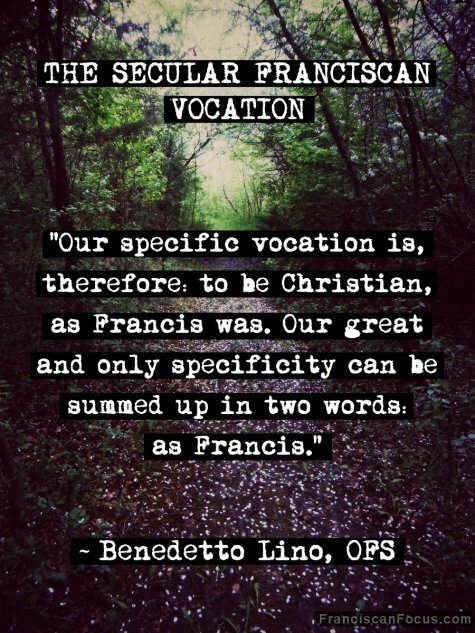 A few years ago, during our 2011 General Chapter, Benedetto Lino, OFS did a superb job explaining our charism and vocation, so I figgered I'd share a few snippets here with all y'all (all emphases are the author's). :-) Do read the full thing! "Without any doubt, our vocation is specific. Indeed, we are not Jesuits, Dominicans, Carmelites or Members of the Focolare Movement or of any other. "... Our specific vocation is to be Franciscan and secular and, as such, it is directly dependent on Francis of Assisi and his vocation. His example and his life have attracted us. God used him to lead us to a specific form of life. So we must turn to and start from Francis if we are to understand our own specific vocation. "... [Our vocation] is specific only because our call refers to an example, a model, a unique way of following Francis of Assisi. This is the true and the only specific element of our vocation that distinguishes us and unites us: to be total Christians, as Francis was. "... Our specific vocation is, therefore: to be Christian, as Francis was. "Our great and only specificity can be summed up in two words: as Francis."